Leatherhead came to national fame in the mid 70's when they got to the 4th round of the FA Cup. They knocked out league sides Colchester and Brighton, who at the time were managed by Brian Clough's assistant Peter Taylor. They even went 2-0 up against Leicester at Filbert Street before succumbing 3-2 in the second half. Throughout that famous run, their striker Chris Kelly was really overconfident in the style of Brian Clough or Muhammed Ali, earning himself the brilliant nickname of 'The Leatherhead Lip' He became something of a celebrity appearing on Nationwide and Tomorrow's World. The goal will be remembered forever - he even appeared on the back of Fletch's paper in the hit TV sitcom Porridge. Sadly there is no footage of the Leicester game on Youtube, neither do I know which episode of Porridge it was in, but I will have fun watching through them to find out, as it's one of my favourite shows. 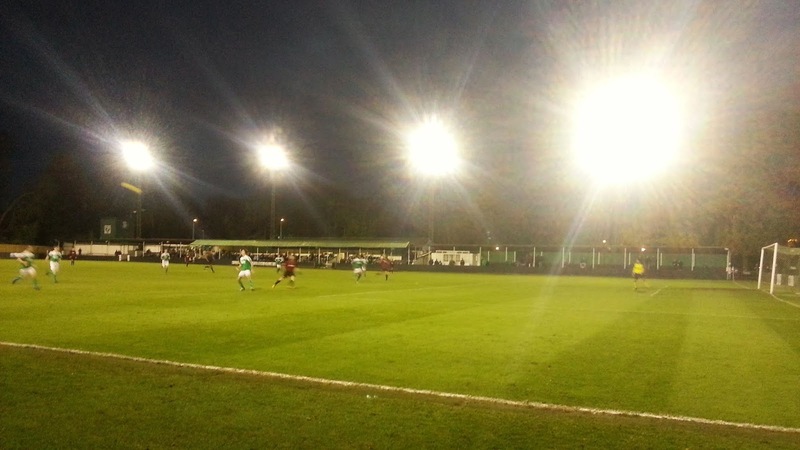 The romance of the FA Cup was not so evident for Leatherhead in this season's FA Cup as they crashed out in the 3rd Qualifying Round after losing 5-1 to Biggleswade Town. From when the fixtures came out, and up until Thursday, today's game was always going to be Chesterfield v Wycombe Wanderers. I know a fair few people up there and also there is a good off license and pub up there, meaning I could stock up on new and random stuff to bring home. But I couldn't find enough people to make driving worthwhile and I didn't fancy going on the supporters coach. So I started looking for alternatives. From an initial list of 17 that came in at under 100 miles round trip, I whittled it down to 3. Highmoor IBIS v Reading Town was a local derby but it was being played at an athletics stadium and I was only going so I could walk into Reading town centre and visit a pub called The Alehouse, as well as have a look round the shops. But after a few drinks watching England's terrible performance in the Ashes, I decided to save that one for another day. The others were Oxhey Jets and Leatherhead. 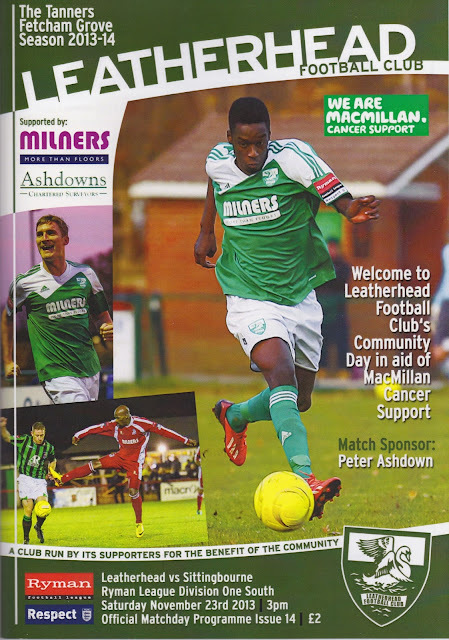 I decided to choose Leatherhead as it was at a higher level and they were doing a special offer on entry - just a fiver which is a good price for this level. 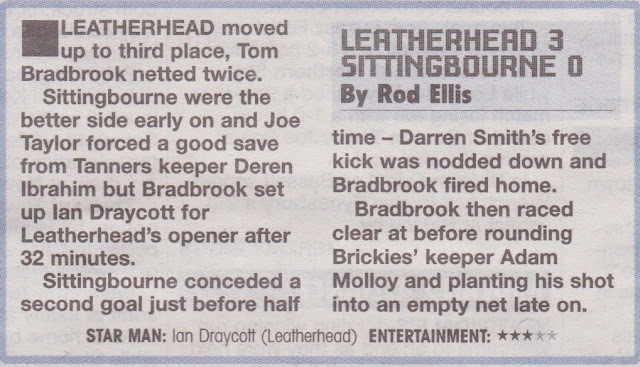 I'd seen Leatherhead play twice before. Firstly in 2003 when they lost 4-2 at Windsor and Eton. I used to watch Windsor a lot at that point as they had a lot of ex Wycombe players and it was one of 117 games that I did that season - a record until my 123 last season. Then in 2010, I saw them in a boring 0-0 draw at Folkestone Invicta, a game that I went to as I was visiting relatives and was more memorable for the decent club shop than the actual game. 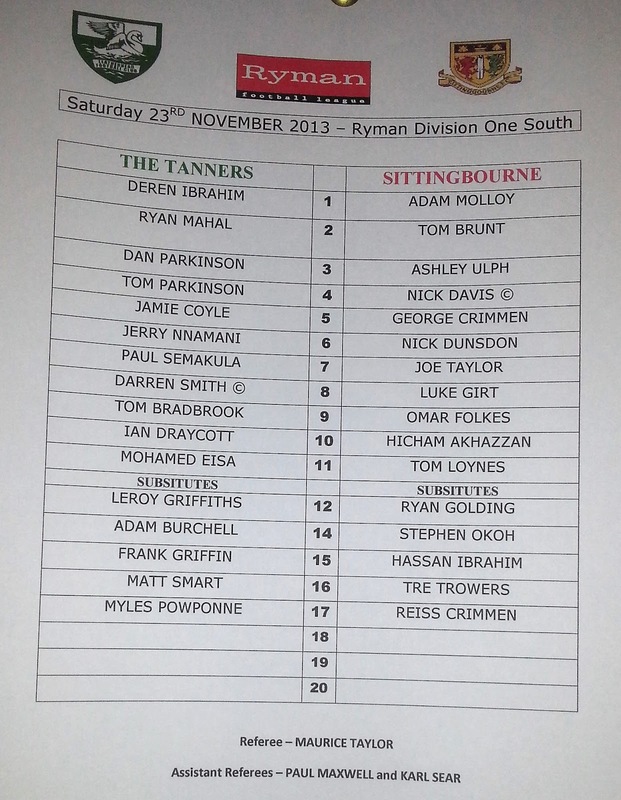 I'd not seen Sittingbourne play yet in the 1390 games that I had seen in my lifetime. On the day I woke to discover that England's bad batting had continued in the Ashes - they were 24-2 at the end of play and now need a miracle to avoid defeat. I had a bath and watched Soccer AM and the first half of Sheffield Wednesday v Huddersfield on Sky. I left home at 1.30 and after a really good journey was at the ground by 2.20. It was quite a mild afternoon for this time of year and decent conditions for watching football. It was community day in aid of Macmillan Cancer Support so entry was only a fiver. There were various activities around the ground too, including face painting for £1 and the woman doing it was making a really good job of it. I got myself a decent looking programme for £2 and went in the clubhouse and got myself a pint of Strongbow and watched the end of the Merseyside derby which was a cracking 3-3 draw. I then went to the club shop and got a pen to add to my collection, then on to the tea bar to get some chips and later a tomato soup. I'd spent a bit more than I usually did, but due to the cheap entry was happy to put more money the club's way - perhaps other clubs could learn from this as goodwill breeds goodwill. 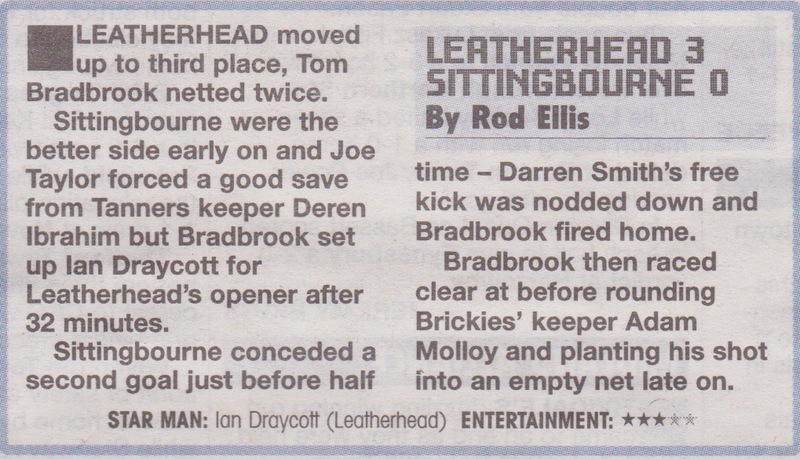 The match itself was OK and I have pasted the match report from the Non-League Paper below. After the game, it was another nice journey home. It had been a good day and perhaps missing out on Chesterfield was not such a bad thing as Wycombe turned in a poor first half performance and lost 2-0, our 4th loss out of 4 at their new ground. Happier news was heard in the fact that Bradford had beaten the Franchise 3-2 and there were a few wins for mates teams. I got home about 6 and listened to Radio 5 who gave some good publicity to one of the few unbeaten teams in the country in Curzon Ashton. It's always good to hear non-league mentioned on the radio rather than obsessing over the Premiership. FETCHAM GROVE is a traditional non-league ground. The near side where you come in is the main stand and runs the whole length of the pitch with a mixture of seating and terracing. Wikipedia says 150 seats but it looked more than that, but it's all fully covered. There is further terracing behind the goal to the left, where another few hundred can be kept dry. The rest of the ground is open hard standing with grass banks behind it. With the trees behind, it's a really nice setting, especially on an autumn afternoon. 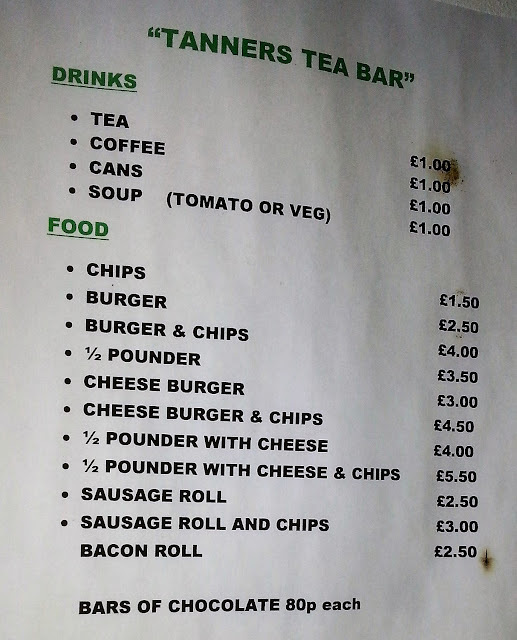 The clubhouse has a fairly average range of drinks but has Sky for the live football. The tea bar is decent too, the chips are nice and there is a good selection of other stuff, but sadly no bovril. The club shop too has a good range of merchandise and sells old books and programmes too. Sadly I couldn't find the Folkestone Invicta one from 2010 as I still need it for my collection. It also has a very random room with board games, books a sofa and TV, also a place where you can make your own tea and food! All in all it's a nice place to visit with friendly people and a ground with some really nice touches.